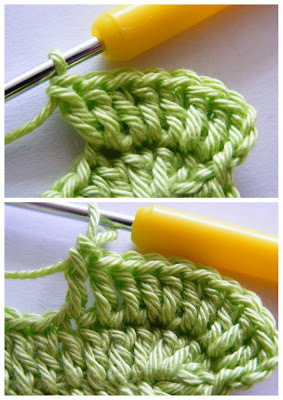 Fizule71: CROCHETED HEARTS - English version! CROCHETED HEARTS - English version! 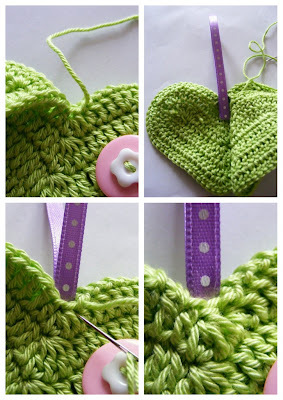 Since my Czech tutorial on crocheted padded hearts was successful and many of English speaking crocheters asked me to translate it, here you can find the English version of the pattern. I hope that you appologize my English because I am not a native English speaker :o) many thanks in advance. 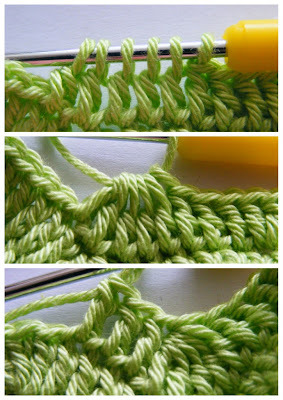 tr (treble crochet) - yarn over, insert hook, yarn over, pull the loop back through the stitch (three loops on hook), yarn over and pull through two loops on hook (two loops left on hook), yarn over and pull through remaining two loops. Begin with 20 ch (center of the heart), work in rounds, around the 20 ch. Each row begins with 3 ch, ends with 1 sl st to the 3rd (!) 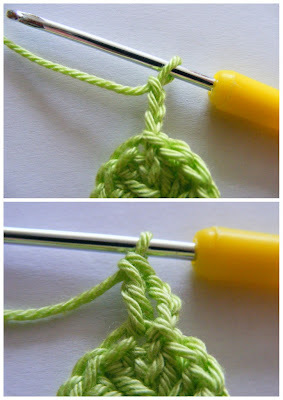 ch (not to the upper loop - see the pictures). 1 tr to each of next 5 ch (totally 5 tr). 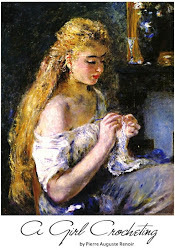 Work under two upper yarns, one remains for the opposite site. Chains won´t be badly out of shape and without unwanted holes. 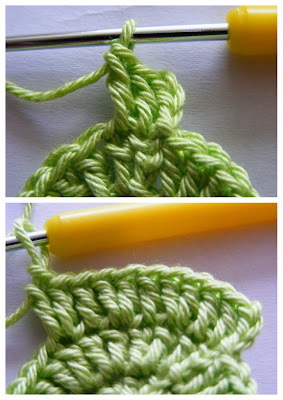 1 tr to each of next 5 ch and crochet together - create a "V" center of the heart. 1 tr to each of next 5 ch. Remains the last ch. 7 tr to the last chain. Here you can see how the heart becames to have its shape. Here you can see the remaining yarns of the basic 20 ch. 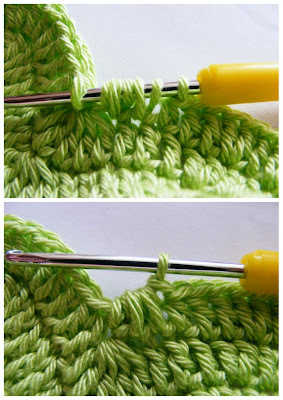 Now work under this single yarn. 1 tr to each of next 7 ch. 5 tr to next one ch (bottom tip of the heart). And again 1 tr to each of next 7 ch. One ch of the basic row of 20 ch remains. 3 tr to the last ch. 3 ch + 1 tr to the same st.
2 tr to each of next 3 st + 1 tr to each of next 3 st.
Work the next 5 tr together (as in previous row). Then 1 tr to each of next 3 st.
2 tr to each of next 7 st.
Then 1 tr to each of next 9 st.
5 tr to next st (bottom tip of the heart). And again 1 tr to each of next 9 st.
2 tr to each of the last 3 st. Finish the second row with the sl st to the THIRD CHAIN from the first three ch, not to the upper loop (see the pictures). 3 ch + 1 tr into the same st. 1 tr to next st, 2 tr to next st - repeat 2 more times. Totally we worked 2 tr - 1 tr - 2 tr - 1 tr - 2 tr - 1 tr - 2 tr. 1 tr to each of next 2 st, 1 htr to next st (upper "V"). Next three htr (upper "V") work together. On the other side of the "V" again 1 htr - 1 tr - 1 tr. For the curve work: 2 tr - 1 tr - 2 tr - 1 tr - 2 tr - 1 tr - 2 tr - 1 tr - 2 tr - 1 tr - 2 tr - 1 tr - 2 tr (7 x 2 tr in one st). ... a again 1 tr in each of next 11 st. Six st remain. To the last 6 st work: 2 tr - 1 tr - 2 tr - 1 tr - 2 tr - 1 tr. Finish the third row with one sl st to the third ch. The basic heart is done!!! 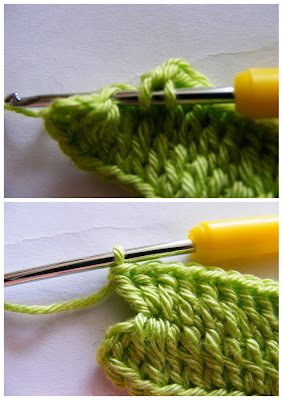 Here you can see the center of the heart - all in-one-stitch and together-worked stitches should be in one row. 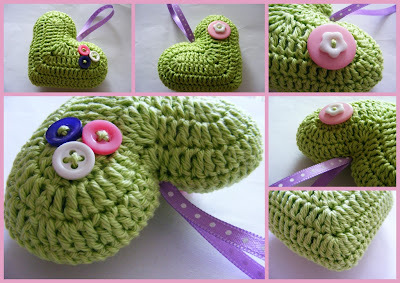 Two identical hearts are needed for the padded heart decoration. They are not necessarily be of the same colour, you can mix two or more colours in one heart as well. 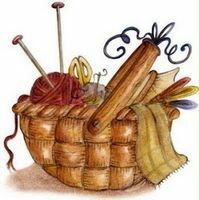 We leave a long yarn from one of the hearts, to sew them later together. 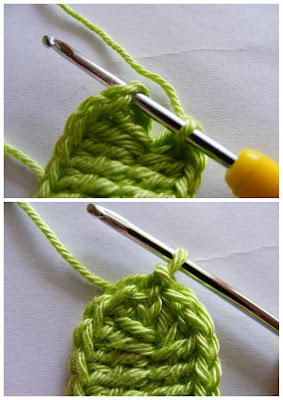 Decorate the crocheted twins as you want. After decorating, attach themselves to the underside. Be careful, the stitches of both hearts must correspond to each other (i.e. the upper "V" to the upper "V", the bottom tip to the bottom tip...)! Sew the hearts together. Insert the needle under the whole upper loop! In the upper "V", you can insert a decorative ribbon between the hearts. 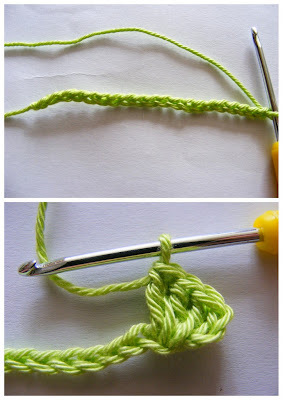 Sew the ribbon through with the needle (see the pictures above). Continue sewing the hearts together. 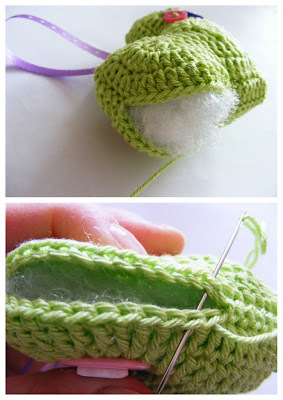 Before you finish sewing of the hearts, leave about 4 cm not sewed. Padd the hearts with the polyester fiber and sew the last 4 cm together. 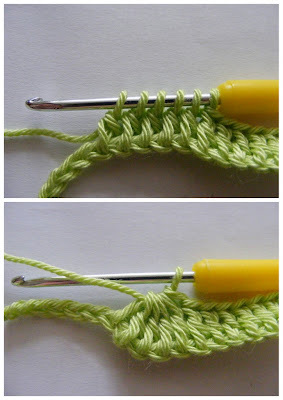 Tie-off the yarn. You can wrap it into a cellophane bag, decorate with a nice ribbon and you have pretty nice gift for mum, granny, teacher and all lovers of romance. PRO ČESKÉ ŠIKULKY: PŮVODNÍ ČESKÝ NÁVOD NAJDETE ZDE. UŽ JE TO PÁR MĚSÍCŮ, CO JSEM HO ZPRACOVALA, TAK MOŽNÁ UNIKL POZORNOSTI, PŘECE JEN JSEM STÁLE BLOGERSKÝ NOVÁČEK A SPOUSTA ŠIKOVNÝCH LIDIČEK SI KE MĚ CESTU NAŠLA TEPRVE NADÁVNO. tak beru zpět, já trubka jsem návod už našla. Nikdy jsem si u tebe nevšimla, tak promiň a vyzkouším. Děkuji za návod. J.
Leni, tak taký rýchlokurz pre začiatočníka čo nevie hačkovať BERIEM. Som Tvoja prvá žiačka.!!!!! Thank you so much for translating into English! I will definitly make these for friends and loved ones! Leničko, Angličanky jásají a já s nimi, tahle jsme ještě nedělala! THANK YOU SO MUCH!!!!!! You are so kind Lenka! 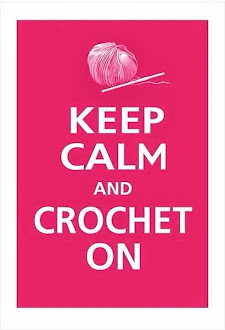 I have some projects on at the moment, but when I get a minute I will be making some of these! Your English is brilliant! What a fab translation! I've just discovered your blog. Your tutorial is really great.Everything is clear and I'll certainly try to make such charming hearts.Thank you so much. Tack! Thank you for the translation!!! These little hearts are now on my to-do list. They are so cute. Thanks you for translating your pattern into English. Janet.